BAYLOR UNIVERSITY, a private Christian university and a nationally ranked researchinstitution, provides a vibrant campus community for more than 16,000 students by blending interdisciplinary research with an international reputation for educational excellence and a faculty commitment to teaching and scholarship. 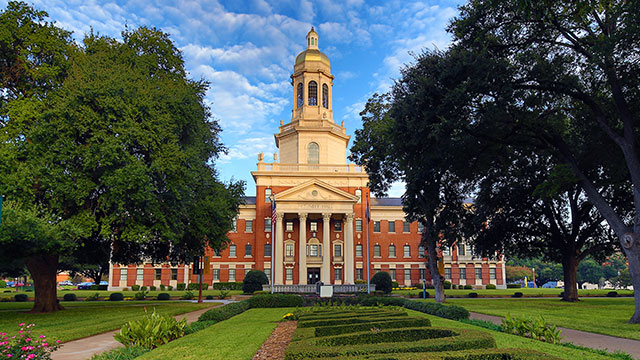 Chartered in 1845 by the Republic of Texas through the efforts of Baptist pioneers, Baylor is the oldest continually operating university in Texas. Located in Waco, Baylor welcomes students from all 50 states, the District of Columbia, and 89 countries to study a broad range of degrees among its 12 nationally recognized academic divisions. Students can choose among 142 undergraduate degree programs, 75 master's programs, and 42 doctoral progams. 86.5% of students find jobs or start graduate school within 90 days of graduation. BAYLOR IS COMMITTED to the highest pursuits of scholarship and offers a distinctive voice to global conversations about crucial issues - such as social responsibility, health care, economic growth, human rights, poverty, diversity, and sustainability - in a way that few others can. Service: Baylor students, faculty and staff annually volunteer more than 150,000 hours of community service locally. Residence: 39 percent of students live on campus in 12 residence halls. Prepared Graduates: 86.5% of students find jobs or start graduate school within 90 days of graduation. Classrooms: The student to faculty ratio is 15 to 1. The average undergraduate class size is 27. Aware of its responsibility as the largest Baptist educational institution in the world and as a member of the international community of higher learning, Baylor promotes exemplary teaching, encourages innovative and original research, and supports professional excellence in various specialized disciplines. International Students CLICK HERE for Baylor's International Profile and Information Page! 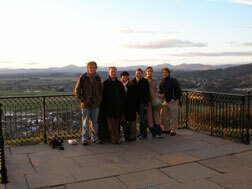 The 2006-2007 academic year was a time of remarkable progress in study abroad and exchange programs. In the 12 month period of Summer 2006 through Spring 2007, 805 students studied in 58 programs in 25 countries. Included in these 58 programs are three semester group study abroad programs, 21 summer group study abroad programs, and 28 exchange programs and 6 others. Anthropology Field School – Guatemala, Baylor in Dominican Republic and Baylor in Mexico – Xalapa are newly introduced summer study abroad programs. The Glennis McCrary Goodrich International Scholarship, based on merit and need, now makes it possible for more students to participate in international education. During this fourth year of the program, 59 students received $91,350 in scholarships. 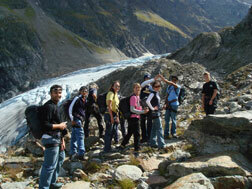 Fall ’06 Baylor in Maastricht-Glacier climbing in the Swiss Alps. Dr. Mitchell presented “How Higher Education in North America is Changing: Trends and Patterns,” at the David C. Lam Institute for East-West Studies (LEWI) Executive Board Meeting, Plenary Panel, Hong Kong Baptist University, P.R.C., October 5, 2006. In October of 2006 a Baylor delegation consisting of Dean Ben Kelley, Dr. William Mitchell, Dr. Stephen Gardner, Dr. Greg Leman, Ms. Julie Corley and Professor Cynthia Fry traveled to the University of Shanghai for Science and Technology, P.R.C., to present papers at The University of Presidents and Executives International Forum: Innovation and Globalization in Education Development. In the Spring of 2007, Wu Fengyu, Director of International Exchanges, University of Shanghai for Science and Technology was hosted by Global Business Forum on the Baylor campus. The Center for International Global Issues Lecture Series, coordinated by Dr. Lizbeth Souza Fuertes, Director of Latin American Studies, included presentations by Baylor faculty: “Conflict in the Holy Land: Hizbullah, Palestine, and the Jewish State” by Dr. Norton Mezvinsky (Central Connecticut State Univ), Dr. Nehemi Geva (Texas A & M), Dr. William Mitchell, Dr. Christopher Marsh; “Hizbollah and the Challenges for Peace in the Middle East.” by Dr. George Gawrych; "The Meta-Narrative of Osama bin Ladin." by Dr. Mark Long; “In the Eye of the Storm: How Hurricane Iris Exposed the Social and Economic Costs of Tourism Development in Belize” by Dr. Sara Alexander; “Economics and Rebellions in Southern Mexico: Elements of a Political Economy of Dignity,” by Prof. Luis Matías-Cruz and “Post-Saddam Hussein, Post-President Bush: Future Challenges for Kurdistan and Opportunities for Baylor,: by Dr. William Mitchell. Campus visitors participating in the Series included: “Europe and the United States: Where do we go from here?” by Dr. Hans Redlef Arnold; “North Korea: The Nuclear Crisis” by Dr. Seon-Wook Kim; “Terrorism, Organized Crime, and Narcotrafficking as Major Threats in Latin America’s Southern Cone.” by Dr. Andrés Fontana; and “Brazos Abiertos, Puños Cerrados: Mexican Cultural Responses to Chinese Immigration” by Dr. Mark Anderson. AREA STUDIES PROGRAM: The biggest accomplishment for the Asian Studies Program (Dr. Christopher Marsh, Director) was the receipt of a 3-year grant worth $1.8 million dollars from the Templeton Foundation to study religion and nationalism in China. The Asian Studies Program collaborated with the Department of Sociology and CRIAD, with whom the grant was written. 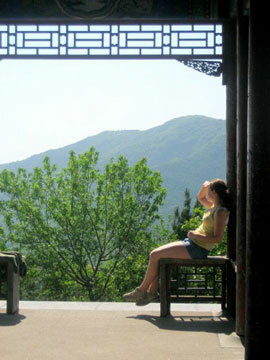 A group of 15 students participated in the first ever Baylor in China study abroad program for summer 2007. The group studied Chinese contemporary social and culture with Dr. Xin Wang; and traveled to Beijing, Xi’an, and Shanghai for four weeks. Dr. Andrés Fontana presented “The Dictatorship in Argentina” which was presented to the Latin American Studies graduate seminar on Latin American Dictatorships and the Role of the Church, taught by Dr. Souza-Fuertes. Four majors and minors in Latin American Studies from Baylor University presented papers at the Fifteenth Annual Latin American Studies Symposium hosted by Birmingham-Southern College on March 30-31, 2007. The Thirteenth Latin American Studies Conference took place on February 9-10, 2007 at Baylor University. Dr. Lizbeth Souza-Fuertes, organized and coordinated the conference, “Race, Religion and Democracy: Latin America in a Globalized World.” The keynote speaker was, Dr. Jefferey Klaiber, jesuit priest and professor of history at the Pontifical Catholic University in Lima (PUC), as well as distinguished guests, Dr. José Luis Gómez-Martínez and Dr. Andrés Fontana, made presentations that varied from race and religion as vehicles or obstacles, the transformation of the educational system, to terrorism and security issues within Mercosur states. In Summer 2007, Slavic and East European Studies, directed by Dr. Mike Long, in conjunction with the Department of Theatre Arts will conduct the Summer 2007 Theatre Design Program in Prague. Theatre design students will present "The Rotting of Tycho de Brahe"--an original play by Robert Askins (BU 2004)--at the Prague Quadrennial in "Design as Performance" (June). Professor Michael D. Morrison, the William J. Boswell Professor of Law at Baylor Law School, is the new Director for the Center of International Education (Jo Murphy Chair) effective February 1, 2007. Professor Morrison replaced Dr. William A. Mitchell who stepped down to continue his research with the Center for Democracy and Diplomacy in Iraq. Professor Morrison has been a member of the Baylor Law School since 1977. He served as interim chief of staff for former Interim President Bill Underwood and current Baylor President John M. Lilley.